If you've been settling into a slower pace of life with Kona beers but want to move on to something stronger, Cruzan Rum might be right for you. 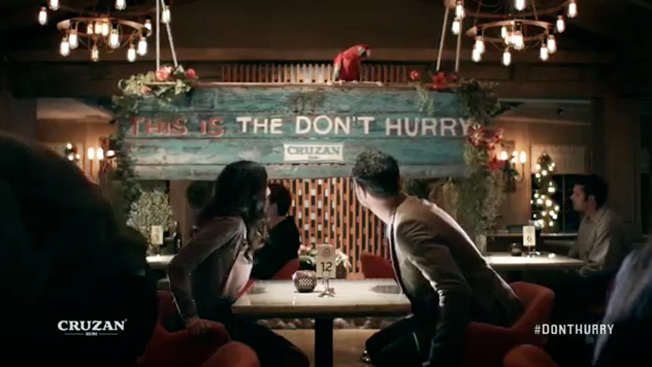 Building on last year's campaign, themed "The Don't Hurry," the brand illustrates that its version of relaxation isn't constricted to the kooky metaphorical island from which it hails. Nope, it's all about a state of mind—and whether you're speed dating or playing chess, you've got to kick back and savor life (and rum). The five new spots by ad agency Walton Isaacson are similar to last year's, which highlighted the eccentric air that came with drinking the rum. This time, though, they've swapped spokesmen, promoting the soothing Barry White-esque voiced parrot.